As confirmed a few weeks ago by Big Scoob himself, a new music video was recently shot for the first single of Damn Fool. Tech N9ne was on the set for the shoot and tweeted fans a firsthand look at the video. Shot on location in Scoob and Tech’s old neighborhood, it looks like the RDV’s are taking it back to the old days. 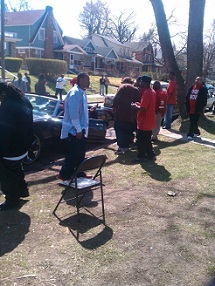 Scoob later tweeted fans with behind the scenes photos of the entire block showin out for the big fella. We will keep you updated on Big Scoob’s new music video. Pre-order Damn Fool here.